Man’s best friend has been a muse to artists since the days of the Pyramids, and this month a myriad of canine-related art events come to New York. Each February, the American Kennel Club stages the Westminster Dog Show, a tradition that ranks as the second-longest-running sporting event in America (after the Kentucky Derby). The event, which premiered in New York City in 1877, actually predates the club itself, which was established in 1884. This year will mark the 136th go-round of the show, which describes itself as “a celebration of the wonderful canine spirit, reflecting our emotional and spiritual attachment to our dogs.” This description is just as apt for representations of dogs in art. Whether an ancient symbol associated with the afterlife, a companion in sport, a languid figure on a cushion or a tenacious poker player, the dog has been a muse to countless artists and a delight to countless viewers. When the first kennel club was established in England in 1883, so were the standards of breed and the regulation of dog shows. As a result, dogs began to be represented in art in a new style, one that William Secord, founder and director of William Secord Gallery in New York and the foremost expert on “dog art” in America, refers to as the “purebred dog portrait.” “With the establishment of the kennel club,” Secord explains, “the way the dog looked became very important. There was a type of painting that developed because of this. What I call the ‘purebred dog portrait’—four on the floor, facing left, head towards the viewer—to show how the dog conforms to the standard of the breed.” These sorts of portraits are in many ways the equivalent of seeing a dog in show, sharing the same intention of capturing the essence of the breed as a whole and the grace and pedigree of the particular dog himself. Secord, in his 1989 book Dog Painting: A History of the Dog in Art, the first and still definitive tome on the subject, defines the heyday of “dog art” as the period between 1840 and 1940, thriving particularly in England. Besides the establishment of the Kennel Club, Secord cites the rise of a moneyed British middle class and the canine-loving Queen Victoria as factors in the dog’s popularity with art collectors. The Queen, who had more than 75 dogs at a time in her kennels at Windsor, was frequently presented with exotic dogs from around the world—a Pekinese from China, a Great Pyrenees from Prince Leopold of Belgium, and so forth. She was in the habit of commissioning portraits of her dogs by top artists, which created a trend. 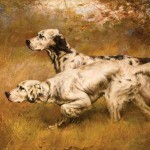 Up for grabs at this year’s sale are two painting by British artist William Henry Hamilton Trood, who was lauded in Victorian England for his depictions of dogs and other animals. The first, Hounds in a Kennel (est. 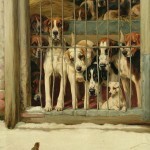 $60,000–80,000) depicts a group of dogs looking at a robin perched right outside their kennel door. In this riff on a hunting scene, the dogs show a keen interest in the bird and an unfailing instinct. The second, titled Dejeuner (est. $50,000–70,000) is a genre painting that captures a peaceful moment among a group of puppies, ducklings and, perhaps most surprisingly, a cat. A contemporary of Trood, Edwin Henry Landseer, is considered by Secord as “the top” when it comes to dog painting. A favorite portrait artist of the Queen’s, Lanseer, who was rumored to be able to paint with both hands at one time, depicted the royal family and the royal dogs many times over. Perhaps most famous is his 1841–45 painting Windsor Castle in Modern Times, a representation of the domestic bounty of Queen Victoria and Prince Albert complete with terriers, a boxer and slain fowl—a true marriage of the “dog on a cushion”-type painting and an “after the hunt” image. So influential were Landseer’s dog paintings that a variety of the Newfoundland breed was named after him, in homage to a series he painted showing the dogs performing water rescue. So what about dogs in contemporary art? 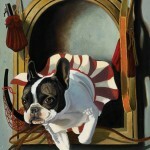 There is a market for contemporary dog portraiture, mostly among those who are both avid art collectors and dog lovers. Christine Merrill, an artist Secord represents, has been specializing in dog painting since 1975, in a style that is an ode to classic “purebred dog portraiture.” New York artist Mimi Vang Olsen is a West Village mainstay whose folk-art inspired depictions of dogs (and cats) are as colorful as they are endearing. There are, of course, contemporary artists who don’t make “dog art” per se, but have become famous for using images of dogs in their work. William Wegman, who gained popularity for photographs and short videos of his Weimaraners, immediately springs to mind. 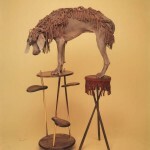 Dressing the sleek and steely-looking dogs in overalls, placing them atop stools or posing them with banjos, Wegman’s photographs personified the Weimaraners as sullen or at times suspicious-looking characters, or employed their lean bodies as sculptural elements. In Rodrigue’s original representation of the loup-garou, a greyer, more ghastly dog sits in front of a haunted red house on what looks like flattened tombstone. Rodrigue, an accomplished portrait artist with a penchant for bayou scenes, began to reproduce the loup-garou in other paintings, but it wasn’t until a show in Los Angeles in 1988 that he was approached by gallery-goers with questions about the “blue dog.” He eventually changed the creature’s red eyes to yellow, and the blue dog began to gain popularity, eventually showing up as a popular image in American culture, in Absolut vodka and Xerox ads and galleries around the country. 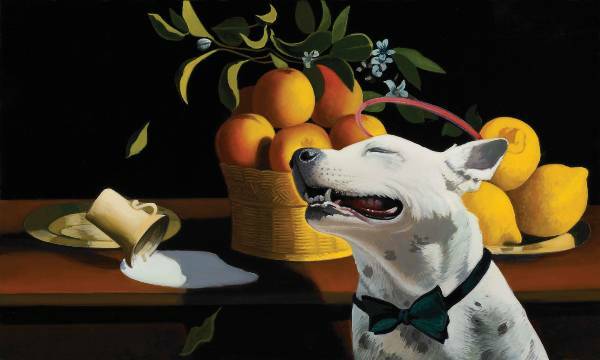 Turning the idea of dog art and the purebred dog painting on its head is Michael Scott’s show “The Doggie Dairies” at Gerald Peters Gallery in New York this month (through February 17). 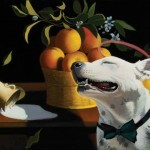 Using rescue dogs as his muses, Scott has recreated Old Master paintings and classic modern scenes with canines near candelabras and floral arrangements, wearing fancy hats and nuzzling bowls of fruit. Scott has used his bold palette to create cheeky Western scenes, fluffy nebulous skyscapes, and trompe l’oeil cabinets of curiosities, but he is new to painting dogs. The opulence of his scenery coupled with the relaxed, everyday quality of the animals serves as a reminder that whether on cushions or toting fowl, depictions of dogs are perhaps at their best when they make the viewer want to reach through the canvas and scratch an ear or two.